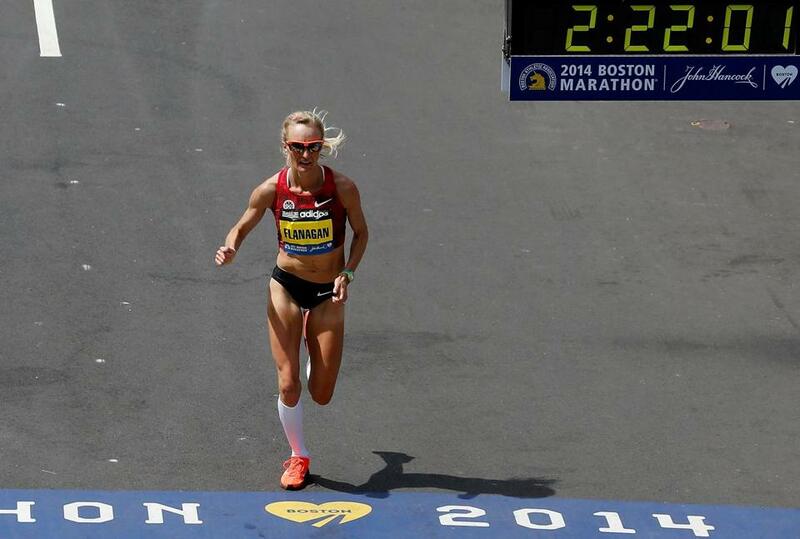 Shalane Flanagan, who graduated from Marblehead High, finished in 2:22:02, the fastest time ever for an American woman on the Boston course. Shalane Flanagan had done everything she could to keep her emotions in check. In the 118th running of the Boston Marathon Monday, Flanagan was locked in on winning her first laurel wreath, hoping to deliver the ultimate tribute to a city eager to leave last year’s tragedy in the rearview mirror. But as the Marblehead High graduate traversed the last mile, making the final turn onto Boylston Street, she could not contain her feelings. Flanagan finished seventh in 2 hours, 22 minutes, 2 seconds, which broke her personal record of 2:25:38 and is the fastest time ever run by an American woman on the Boston course. Immediately after she crossed the finish line, she was overcome with emotions and couldn’t fight back her tears. “I love Boston so much, I really wanted to do it for my city,” she said in an interview with WBZ-TV. Flanagan certainly had nothing to hang her head about. 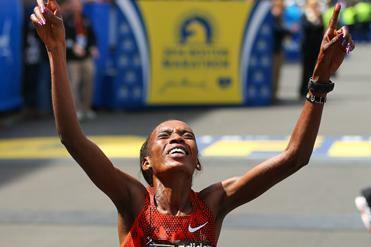 From the starting line in Hopkinton, Flanagan pushed a ferocious pace for Kenyan winner Rita Jeptoo, who won her second consecutive and third overall Boston Marathon, beating the course record of 2:20:43 with a 2:18:57 performance. The second- and third-place finishers, Buzunesh Deba and Mare Dibaba, also finished ahead of the previous record with times of 2:19:59 and 2:20:35. Flanagan led the elite pack for the first 19 miles, falling behind briefly at various water stops, only to make an assertive statement by sprinting back to the front of the pack. With the exception of the first and third miles, she surpassed the record pace every time until she finally lost the lead. It was an aggressive approach, but Flanagan, who frequently returned from her home in Portland, Ore., to train on the Boston course, was confident and trusted herself. She felt her goal of 2 hours and 22 minutes would be fast enough to win. “I had fallen in love with this course,” Flanagan said. “I wanted to use it as an advantage and that’s why I attacked the course. I wanted to give it everything I had. Flanagan ran the race for the first time last year, finishing fourth with a time of 2:27:08. Just three days after the bombings, Flanagan was the first to submit her entry for this year when she called Mary Kate Shea, who helps assemble the John Hancock Elite Field, to promise she would be back. “I just wanted to send the message I was not afraid to be back here and wanted so much to be part of this day,” Flanagan said. From that moment, Flanagan was determined to come back even stronger. This year, she didn’t need three days to decide if she would be back next year. Anthony Gulizia can be reached at agulizia@globe.com. Follow him on Twitter @gulizia_a.